The woman is about to leave the High Whoredom Christendom and climb into the Ephah. She will be taken to Shinar where she will have a place prepared for her. Rick Joyner and Paul Cain, in their own words, are preparing the place along with Saddam hussein. There is NO "Mystery Babylon." Read your King James Bible. There is a comma between "mystery" and "Babylon." Babylon the Great" is still the literal Babylon in Shinar. I won't get Pentecostal right now, but I sure may do some shouting. As of 2012, enter the United Nations as the political base of the Whore of The Revelation. This page is arranged in a reverse format from what is usual. We start with my latest research and observations and move to the oldest. I want you to see that Babylon restored is NOT a come and go event. It is at the very end of the Times of the Gentiles and must before Armageddon and the return of Christ in power and great glory. and will be very important in the coming days. What does this mean to Americans and Europeans? Finally, after 9/11, clearly a black flag event to justify the Patriot Act reduction of the USA to a fascist state, the next most obvious black flag event would be the destruction of the United Nations Building. This would give the UN a good excuse to move to Iraq and set up shop in the restored Babylon. Is this why the US built the biggest embassy on earth in Iraq which cost $700,000,000? As far as I am concerned, the US Embassy has been built to be quickly finished with landscaping and ornamentation to suit the UN's needs. UN members are coming to a consensus that they need to move to Babylon. One has to wonder if the ongoing sabotage of the USA by Washington DC and the Hidden Hand is right on course for the fall of the USA and the rise of Babylon. And, one must also wonder if God is totally responsible. Before you think I have lost my marbles, go and read the STRONG DELUSION series of articles at this journal. In order to block President George Bush's planned war on Iraq, Pope John Paul II sent an envoy to Iraq. This is the woman starting to move to Babylon, Shinar, looking for a place to establish the world headquarters of the Whore Church-- See the text from Zechariah 5:5 below. Coincidental with the Latter Rain/New Age agenda to celebrate Tabernacles in the proposed Year of Jubilee, the Vatican Central Committee is coordinating with other Catholic Rites and church conferences, such as Episcopal, Anglican Communion, World Lutheran Federation, World Reformed Alliance, Methodist World Council, the World Council of Churches for a celebration of the Great Jubilee "which will take place simultaneously in the Holy Land, in Rome and in the local Churches throughout the world." In ancient Israel, the 50 year Jubilee celebration freed all slaves, canceled all debts, and restored properties to the original owners. Pope John Paul II, New Age/New World Order planners and Pat Robertson of the Christian Broadcasting Network have all called for the worldwide redistribution of wealth and cancellation of debt in 2000 A.D.--severe measures that would precipitate the collapse of secular economies which have not planned for this adjustment. Vatican envoy, Cardinal Roger Etchegaray, has been sent to Iraq to allegedly look for a way to avert war. I am convinced that this is an effort to establish the Great Whore Church in Babylon. Etchegaray is a New Age agent of change on behalf of the Vatican. Tariq Aziz is also traveling to see Pope John Paul II this week to seek his intervention in the US war plans. This is the harbinger of Zechariah 5:5 when the woman in the ephah, the Whore of The Revelation, is planted in Babylon. 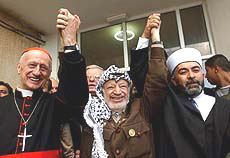 Look who fawns over Etchegaray - Etchegaray, in 1998, was the mastermind of a journey to the Ur of the Caldeas by Pope JP II, which the Iraqis squelched. In 1985 the Cardinal visited troops in Iraq during the war with Iran. In a news conference today, Etchegaray said he was concerned about the destruction of the cities in Iraq. Right! Especially Babylon. Etchegaray was the organizer of the Assisi prayer meeting by Pope JP II in which all manner of pagans gathered to pray for peace. Etchegaray's New Age and World Church activities. The end times moment is ever more terrifying, yet it should cause us to rejoince to realize how close we are to our Lord's return for his True Bride. Why did Serbia catch the wrath of Franciscan, Javier Solana? During the Bosnian war, the Pope tried to send the envoy, Cardinal Roger Etchegaray, to the Balkans during the Easter season to say services on his behalf. But Bosnian Serbs did not agree to the trip. Etchegaray visited Bosnia and was ignored. See the February 3 discussion of this topic. You can see that the Whore Church system is closing in on Babylon and Jerusalem. Here are the texts to keep in mind as you read Joseph Chambers' article. The Mother is the "madam" of the historic whorehouse. The "harlots" are the Vatican, World Council of Churches, Islam, Hinduism, and all manner of filthy religious whores. But there is historically only ONE Mother, and that is Babylon. 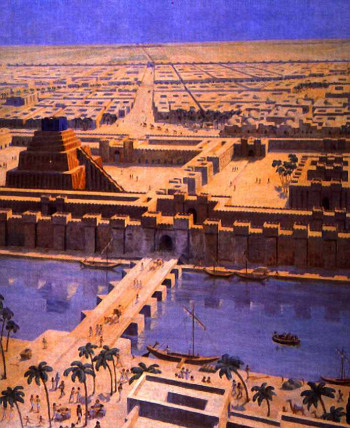 All modern religion leads back to Babylon and Sumer, the heritage of Nimrod. Though Gilgamesh and Ishtar are set aside, this filthy line or whores is seen today in the Mary of the Roman Catholic Church, the Allah and Allat divinities of Islam, Kali and Shiva of India, Mithra and Isis of the New Age, the earth goddess Gaia of Al Gore and the One Worlders, and the goddess of neo-paganism and witchcraft. 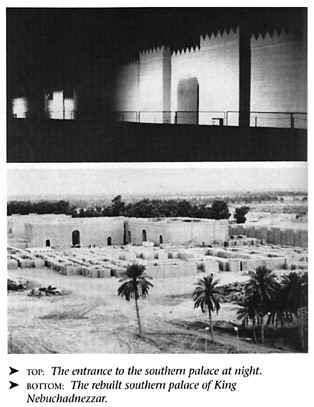 Saddam Hussein has rebuilt Babylon in fine detail. He allowed not one shred of Islam-- only the pagan forms of ancient Babylon and Sumer. It is a place of vast glory. Who are the two women who carry the woman back to Shinar? I believe now that they are the ____________________ and the ___________________. (I am sorry, but it would be a "hate crime" to name the two women.) They have the wind of the unholy Spirit of Satan in their wings. The stork is a dirty bird in Mosaic law, so we know they are wicked. The two harlots of modern Christendom will soon carry the "MOTHER" of harlots back and establish her in Saddam Hussein's palaces. Then, Jeremiah 50 and 51 can be fulfilled by Jehovah-- His final revenge on Satanic and humanistic religion. Iraqis go out to Babylon on the weekend for picnics, and grand events have already been help there. Soldiers guard the city and march in parades there in ancient uniforms and with period weapons. Every few bricks Saddam Hussein has had his name engraved in a brick, as well as Nebuchadnezzar II's name on others. The opera Aida has been performed in an outdoor theatre at an event attended by artists from around the world. All that is left to complete the city is the irrigation system and the hanging gardens. The New World Order: How Close? The words of Paul Cain and Rick Joyner are given with no commentary. You must figure this out yourself. Rick Joyner seems to find pleasure in visiting the historic sites of the Nazi Regime? The time of the Crusaders was the actual time of history when the Knights of Malta was founded. Following is an explanation of why the Knights of Malta is knighting non-Catholics and persons outside the nobility ranks of Europe. "The Sovereign Military and Hospitaler Order of St. John of Jerusalem of Rhodes and of Malta, known also as the Sovereign Military Order of Malta, or SMOM, is juridically, politically, and historically unique in the world today. "Representing initially the most powerful and reactionary segments of the European aristocracy, for nearly a thousand years beginning with the early crusades of the Twelfth Century, it has organized, funded, and led military operations against states and ideas deemed threatening to its power. It is probably safe to say that the several thousand Knights of the Sovereign Military of Malta, principally in Europe, North Central, and South America, comprise the largest most consistently powerful and reactionary membership of any organization in the world today. "Although an exclusively [Roman] Catholic organization, in this century it has collaborated with, and given high awards to non-Catholic extremists in its current crusade against progressive forces in the West, the national liberation movements, and the socialist countries. Rick Joyner and others are excited to be knighted. Lets read some detail of that. Lets listen as Rick Joyner tells about the arrangement of this meeting. He starts at the point where we just ended in telling of the Baron from Austria being overwhelmed by the alleged prophetic abilities of a man with Rick Joyner, named Bobby Connor. Please read carefully. "Bobby told him a little bit more about the papers and everything and it really got his attention. He was captured from then on . . . And he was a prophetic man. He was the one who prophesied to Indira Gandhi that if she did not give her heart to the Lord, she would be dead in one week . . . Five days later she was assassinated. And he is a friend with head of number of the Moslem nations, as well as other countries, and hes been a prophetic voice to them, but he had never seen the gift operate like this in such a specific way about details like that, so he was just captured. "This worked out strategically in a way you wouldnt believe. It was important, but this was the guy who was key to getting Paul Cain an audience with Saddam Hussein. You may have heard us talk about that. And Paul went. Saddam Hussein, some of his guys had been in a meeting, had seen the prophetic gift operate and they were utterly convinced that Paul is a true prophet. Saddam became convinced and he wanted to meet with Paul. Okay! It all worked out. Well, Newman was the guy who worked this out. And right after he sent the fax to start this process all this fear came on him, What have I done . . . this could really mess up world events and things like that. He didnt know Paul Cain that well . . . And right after that the Lord had told Bobby Conner to fax Newman Peyton and just write this that Paul Cain is my man, hes okay, dont worry about it or something like that. To imagine Saddam Hussein calling a Charismatic prophet. In a publication recently brought to my attention entitled, "Prepare For War," some clarification of the prophecies is seen. Paul Cain, whom we will quote as he talks glowingly about Saddam Hussein of Iraq, is one of the main voices speaking about Joels Army. Another man, Bob Jones, who is close to Paul Cain and Rick Joyner, called them "The Dread Champions." Now, you can understand why Rick Joyner considered it delightful to visit the history archives of Nazism in Germany. According to Rick Joyner, a friend of Kurt Waldheim and a member of the Catholic organization, the Knights of Malta, arranged the meeting between Paul Cain and Saddam Hussein. This meeting was so important that the "Lord Jesus Christ" is credited with directing all the details and causing it all to happen. The entire story is intriguing, but lets begin with their arrival in Baghdad.
" . . . The Lord really got us there. When we got there we were given the red carpet treatment and allowed to stay in a guest house in part of the presidential palace. That was not bad at all (laughter). That evening, we had our first meeting . . . (Minister of Foreign Affairs and, later, the Deputy Prime Minister). And, on day two, our visit with President Saddam Hussein at his palace . . . But, after the initial greetings, I started the meeting with President Saddam Hussein by repenting on the part of America for what weve done to that nation, to him, and to his people. And, I nearly lost control. "I tell you I was just on the verge of losing control because I thought of the round table meeting we had here and how God met with us in that round table over here in the other building (Morningstar Ministries, Pineville, NC) and how God used repentance in such a forthright way, in such a powerful way . . . Just before sobbing, both of us began to cry. Saddam Hussein began, tears began to come. If it hadnt been for calling this in check immediately, there would have been the strangest sight I think the world could ever see . . .
"This, so called, madman breaking to pieces and everybody knew what was about to happen. He said some of the most powerful things and I am very much shocked and surprised that the madman that we were supposed to meet turned out to be a family man, turned out to be somebody that made some bad mistakes in the past. But, turned out to be someone humble enough to say some things that would blow your mind. You could just sit there and feel the spirit that he employed when he said this. Its true that this man is a very dominant military leader, but he is not a madman. All of Iraq seems to love this man. The Christian church, especially, seems to love him . . .
"He said, I have never found an answer as to what America has gained by vilifying Iraq unless I look to the spiritual. (Notice that statement.) God must have wanted to humble us. Does that sound like a madman? Does that sound like a madman? When he would speak of our president as the most powerful man on the face of the earth that God had raised up, the United States as being the last of the great super powers . . .; President Hussein replied with this, President Clinton is not only the hope of America, hes the hope of Iraq, and hes the hope of the whole world. (This was before Clintons second election.)" "But what ultimately brought peace was when God gave him wisdom. Almighty God gave him his wisdom to go and sit down with his enemies and to reason with them . . .
"We talked to him about the church in Iraq and asked him hard questions about different religions in Iraq. He said, Iraq is the only Arab nation where you will find Christians and Moslems, all kinds of Moslems and Christians living side by side. He said that this diversity and tolerance goes all the way to the top of the government . . . I found that striking that the Deputy Prime Minister was a Catholic and his wife was a Spirit-filled Christian. It was really not what we expected." Mr. Cain spent an entire evening with the Deputy Prime Minister, who was the Catholic, and his wife, apparently, a Charismatic. He said they talked for several hours. One wonders if the city of Babylon has been a part of their discussion. There has been a tremendous amount of interest in our short article on Rick Joyner and his experience with the Knights of Malta. The aspect of Paul Cain and his secret meeting with Saddam Hussein is an ongoing story. We all have watched Saddam Hussein stare down the world over and over. He rides each crisis with an increased degree of arrogance and pride. At the same time he is busy building up his strategist nation of Iraq and the ancient city of Babylon. Following is an excerpt from our book, A Palace For The Antichrist, that shows how the Antichrist will be an Assyrian and maybe even an Iraqi. "The Seat Of The Antichrist"
"The Middle East is the center of the whole earth; Babylon is the seat of Satan; Jerusalem is the spiritual center of the Judeo-Christian revelation and soon to be the seat of Christs kingdom. Iraq is rightly called the Cradle of Civilization because the Garden of Eden was in its southern tip where the Tigris and Euphrates Rivers meet just before entering the Persian Gulf. To look for Satans final activities in any other area than the Middle East is to look in vain and in error. "It is very important to establish the geographical location for the Antichrists appearance and the Holy Scripture has done so very carefully. Daniels vision of the four wild beasts (Daniel 7:1-28) gives a clear picture of the last four World Empires. All four are seen to appear from the geographical area of the Mediterranean Sea. "Daniel spake and said, I saw in my vision by night, and behold, the four winds of the heaven strove upon the great sea. And the four great beasts came up from the sea, diverse one from another." The scholar G.H. Lang said, "In Hebrew usage the great sea is a proper noun and means invariably the Mediterranean." Every political power in the world is at this moment focusing on the Middle East. It has been utterly confirmed that control of the Middle East is the key to world influence. America and Russia have both positioned for this privilege for many years. Our military might and government are constantly seeking to influence the activities of this region. "The Scripture has left no doubt that this beast of a man will be from Assyrian nationality. Three times Isaiah called him by this name, "O, Assyrian, the rod of mine anger, and the staff in their hand is mine indignation." (Isaiah 10:5). This clearly suggest that he will attack Israel while they are still in unbelief. Isaiah further states: "I will break the Assyrian in my land, and upon my mountains tread him under foot: then shall his yoke depart from off them, and his burden depart from off their shoulders." (Isaiah 14:25). In this prophecy, Gods prophet declares that the Antichrist/the Assyrian will be broken upon the mountains of Israel which God calls my mountains. "Now note the third reference, "Behold, the name of the LORD cometh from far, burning with his anger, and the burden thereof is heavy: his lips are full of indignation, and his tongue as a devouring fire: And his breath, as an overflowing stream, shall reach to the midst of the neck, to sift the nations with the sieve of vanity: and there shall be a bridle in the jaws of the people, causing them to err. Ye shall have a song, as in the night when a holy solemnity is kept; and gladness of heart, as when one goeth with a pipe to come into the mountain of the LORD, to the mighty One of Israel. And the LORD shall cause his glorious voice to be heard, and shall shew the lighting down of his arm, with the indignation of his anger, and with the flame of a devouring fire, with scattering, and tempest, and hailstones. For through the voice of the LORD shall the Assyrian be beaten down, which smote with a rod." (Isaiah 30:27-31). To see key Charismatic leaders moving into the framework with Saddam Hussein is breathtaking. It is incredibly tough to get good facts on the Knights of Malta. They apparently are connected both to freemasonry and the Catholic church. Whatever time we have between the present and the Rapture promises to be a fast ride full of interesting details. One thing of absolute importance is to stay close to Jesus and to be wise of all that is happening. Dont put your head in the sand and do not be afraid. If you are His, you will be out of here at exactly the right moment. The King is coming and the Saints will be gone. Do you have information on Paul Cain, Rick Joyner, or others that may be involved with the Knights of Malta or Saddam Hussein? If so, call 1-800-338-7884! You, reader must read and think, for we are not free to make any further conclusions. VATICAN, Oct. 19, 00 (CWNews.com) -- The Vatican's chief public spokesman has dismissed a suggestion-- introduced by a Belgian cardinal-- that Pope John Paul II may resign at the end of the Jubilee year. Joaquin Navarro-Valls said that there was no foundation for speculation about the Pope's resignation. A new series of speculative stories on that topic have appeared since Cardinal Godfried Danneels of Brussels wrote, "I would not be astonished if John Paul II offered his resignation after the year 2000." That comment appears in a book of essays and interviews by Cardinal Danneels, which will soon be published in the Netherlands. Cardinal Danneels points out that since Vatican II, bishops have been required to submit their resignations when they reach the age of 75. The Belgian prelate went on to say about Pope John Paul: "He absolutely wanted to be present for the Jubilee of the year 2000, but I think he is capable of retiring afterward." Navarro-Valls told reporters that this speculation "involves the personal of Cardinal Danneels, for which there is no confirming evidence." Revelation (Apocalypse) 13:11 And I beheld another beast coming up out of the earth; and he had two horns like a lamb, and he spake as a dragon. it is highly significant that the Whore is sending 13 whorelettes to Iraq !